Some quiet thoughts : Reflections: A faith struggle- straight from the heart. 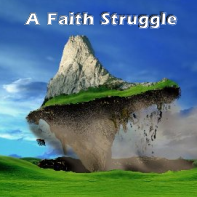 A faith struggle- straight from the heart. Life throws many things at us - good, bad, perplexing and simple. The Christian life is no different. As life rolls on, we encounter so many different situations not only in our lives but also that of the family, friends, neighbours and colleagues. This is an honest, straight from the heart blog - no pretense, no mask, no charades. Today is a day that started with many question assaulting my mind. I feel like the psalmist David who was perplexed at times. Maybe you too feel like this sometimes.Then reflect with me..
We are called to live by faith and not by sight. WE are sons of Abraham, the father of faith. Jesus said if we have faith even as mall as a mustard seed we can say to a mountain "move" and it shall be done!!! However, today I sit reflecting on those mountains that need moving and NOW. They seem to have been around for a looong time : mountains in my own life, in the lives of my friends, family, church. Mountains of crippling health situations, failing finances, relational strive, challenging addictions, a battle for spiritual fruit. The list can go on and on. I think of all those people of the "faith movement" who keep shouting "believe it, name it, claim it..", like a magic mantra! You don't possess it because you don't have faith. How re assuring!!!! But, when I anchor in the WORD I see two things happening- there are the suddenly s of God - where God breaks upon a situation causing the dead to come alive, the blind to see, the cripple to walk, finances restored, the stranglehold of addictions broken, storm stilled. As Job said shall we accept only goodness from God and not accept the trials?James encourages us to persevere under trials, testings of many kinds. I know that my God is sovereign and in control. His ways are higher than mine and incomprehensible a lot of the times. When I sit perplexed on such a day as this, I know that in times like these, the wise thing to do is to sit still in His presence, still my soul and find rest in God alone. He is my anchor, the horn of my plenty, my refuge and strength in times of trouble. My heart goes out to all those who I am praying for today - those struggling with illness, the pain of bareness, for children who long to see their father delivered from the clutches of alcohol, those who are longing to meet their life partner, the poor who feel trapped in their helpless state. Oh , this list can fill pages.. I know I long for rapid answered to prayer. But I also know I believe in a prayer answering God. Scratched out prayer lists over the years bear testimony to God's faithfulness. So I am learning to straddle the truth that faith can move mountains and will; while on the other hand there is the waiting and the possibility that the answer to a prayer is actually a "no". I am reminded of a quote:WHAT IF ? This I know, God is for me and for all those who love Him and are called by His name. While we are promised abundant life ( the definition to that is open ended and does not consist of material blessings only ), Jesus also reminded us that in this world we shall have many troubles and I have to straddle the two truths with His grace. So I end this morning's reflections lifting my eyes to the maker of heaven and earth, to Jesus, the great high priest who was tempted in every way therefore able to sympathies with my weakness. He is the author and finisher of my faith. He will keep me strong till the end. I'll end with copying the lyrics of a song I recently wrote and if you struggling to find faith in your heart - focus on Christ the hope of glory. Stay strong, keep the faith!